Following America’s entry into World War Two, there was a necessity for the Royal Navy to strengthen co-operation with the United States Navy. 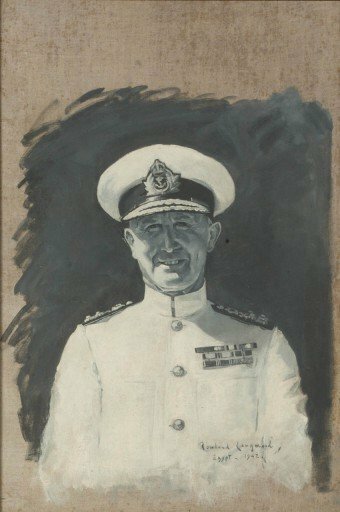 Admiral Sir Andrew Cunningham’s brief term as head of the British Admiralty Delegation in Washington was to endear him to the Americans so much so that they proposed him as Allied Naval Commander of the Expeditionary Force which was to invade North Africa in November 1942. In October 1943, Cunningham was summoned to replace the dying Pound as First Sea Lord, a position he held until his retirement from active service in June 1946. In that time he presided over the invasion of Normandy, operations in the Mediterranean, the sinking of the Scharnhorst and Tirpitz, the defeat of the late surge of U-boat activity, the British Pacific Fleet, and the problems of manpower, the futures of the Royal Marines and the Fleer Air Arm, and the conversion of the Royal Navy from its swollen wartime strength to a much-reduced peacetime cadre. Cunningham remained concerned over the future of the country’s defence and that of the Royal Navy and he was able to speak in major defence debates in the House of Lords. He died suddenly in 1963 and was buried at sea. Cunningham was one of Britain’s great sailors, a worthy successor to Nelson, whom he admired and many of whose qualities he displayed. This second volume of Cunningham’s papers covers the period of his life from 1942. It includes official documents but also many letters to his family and brother-officers that exhibit his feelings, as well as his illuminating diary entries from April 1944 onwards. Navy Records Society between 1994 and 2000. Anglo-American Naval Relations 1917-1919 (Navy Records Society, 1991). The Somerville Papers (Navy Records Society, 1995). The Cunningham Papers 2 volumes (Navy Records Society, 1999 and 2006). Cunningham: A Life of Admiral of the Fleet Sir Andrew Cunningham (Ashgate, 2004). Anglo-American Naval Relations 1919-1939 (Navy Records Society, 2010).